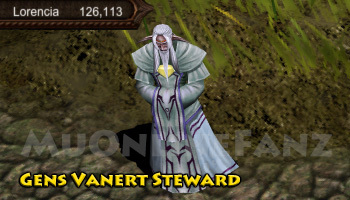 Gens Vanert Steward <+> [MU Online Fanz] <+> Official 3rd-party [MU Online] Fan Site & Game Guide! Conrad is the Gen Vanert Steward. 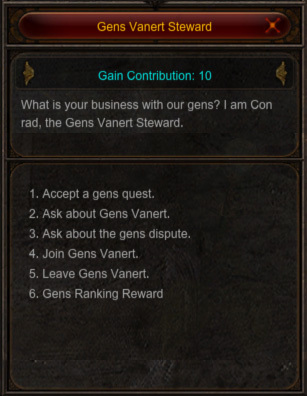 Speak with him to learn more about Gens Vanert. This NPC can be found in the safe-zones of Noria (168, 99). "Gens Vanert is a noble family led by Vanert Reicht, the greatest socialite around the clock to put a stop to Duprian Winston and his dream of absolute rule over the empire. Vanert Reicht may have conceded leadership of Noble Alliance Arca to Duprian Winston at the alliance's inception, but the master has always remained committed to eliminating the foul minions of Kundun and to the revival of the MU empire. Everyone knows about Duprian Winston's desires to subjugate the empire under his absolute rule. It's imperative that heroes like you help Vanert Reicht seal away Kundun and restore peace to the MU empire."